By mid-1953, Argo’s series numbering had all turned out to be a bit chaotic. "At the request of the trade we are re-numbering our records in order to clear up the confusion of our previous prefixes," the label announced in a press ad. All 12" LPs would now be designated RG and the 10" LPs TM. Classical music in white, spoken word yellow, folk music in green. Earlier release details given in brackets under the RG issue number. RG 28 Eric Parkin (piano) John Ireland – Months mind, Pieces, Prelude, Rhapsody, Sarnia 1954? RG 46 Joan Stuart (soprano) Gordon Watson (piano) Alexander Young (tenor), members of the Renaissance Singers cond Michael Howard Delius – songs 1957? RG 73 Oxford Chamber Players dir Raymond Clauson John Jenkins – Fancies and Ayres 1957? RG 88 Stephen Spender (reader) Spender – Reads a selection of his poems 1958? ~ by folkcatalogue on February 24, 2010.
i recently got a copy of under milk wood in a charity shop – the LP cover opens as it’s a double album but there’s nothing on the middle insides of the sleeves – totally blank -is that normal? Great website. hey dave, to tell you the truth i don’t know. i think they mostly had inserts giving info, but not sure which version you’ve got. sounds like a gatefold, but would be surprised if the original 1954 issue was that. what’s the picture of? is it a guy with big eyebrows in a sea or the more cartoony version signed by olga lehmann bottom right? Wanted! Who can sell me the LP RG19 or a copy in normal CD format? NO MP3, please! Looking for this LP from Alan Wheatley for long. 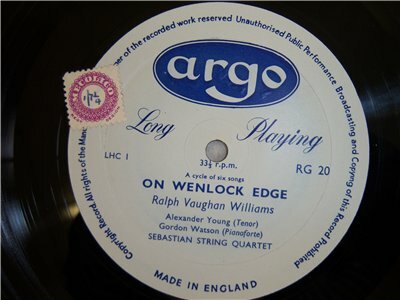 Any hint where I can buy it or get a copy from this and other records spoken by Alan Wheatley are thankfully appreciated! Hi, there’s a copy of the earlier Argo release of Lorca poems (ARS 1016) on music stack. click here. Haven’t been able to establish whether that’s the Wheatley translations or something completely different. worth checking out. let me know if you get anywhere. good luck. Thank you for your quick reply. Unfortunately the record was already sold. Seems, I have no luck to get this record. Many many thanks to everybody who helped me to find it! Good news! I want one! I recently acquired a copy of RG 34 Chansons de France in playable condition if a bit crackly. Didn’t realised it was quite so old – thanx for the info. Hi, where can I get a recording of RG11. Not the LP itself (it would never survive the journey through the post to me in South Africa), but an electronic copy that can be sent via the Internet? For the Issue Nos where no artist/title is given, is this because the Nos were not used or is it because the details of the record are not known ?